Fanmats carpet tiles are the perfect flooring solution for any sports lover or enthusiast. Fanmats are mostly used as residential carpet tiles and have been installed in many rooms as including basement flooring, man cave flooring, game room flooring, living room flooring, and more. 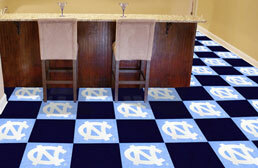 Carpet squares are incredibly easy to install and can be done by anyone! Tile install with the use of double sided carpet tape and can be easily replaced if damaged beyond repair. 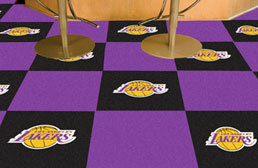 We have carpet tile flooring for the big NBA, NFL, MLB, NCAA, and NHL teams. 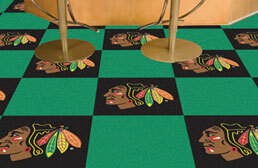 Support your favorite sports teams with these unique carpet tile squares from FANMATS. Easy to install with provided double sided tape pads, these tiles are great for any rec room, man cave, basement and much more. 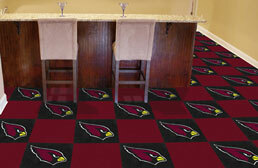 These modular carpet tiles feature NFL, MLB, NBA, NHL, and NCAA teams.